Much of who we become is shaped by the people God places in our lives. We are all a product of the love and wisdom we glean from family and friends who sow into us. They guide and teach us, leaving an indelible impression not just on our hearts and minds, but on future generations as well. 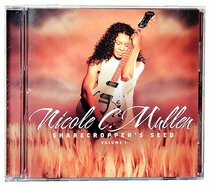 On her new Word Records collection, Sharecropper's Seed Vol. 1, Nicole C. Mullen examines the gift of relationships. Whether saluting her grandfather in the title track or sharing the tender mother's lullaby "Babylove," Nicole celebrates the rich tapestry of life. ^^"It's all of our stories," says Nicole. "We all have come from someone else's toil. They've prayed for us or planted seeds on our behalf or encouraged us along the way. We all have somebody who's responsible for the great harvest that we might receive in life. For me, it's my mama, my grandparents, and my dad." ^^Her maternal grandfather inspired the title track of the album. "My inspiration came from a conversation that I had with my mom," she recalls. "She was speaking about her dad and how they grew up in Georgia. He was a sharecropper when she was a small child and life was hard, but at the same time he had a hope and a dream for a better life for his family. "^^As a sharecropper, Nicole's grandfather had to give a portion of his crops to the landowner. It was a hard life, but it didn't rob him or his family of the joy they found in their faith. That priceless legacy was passed down to her. ^^"Many people in my family have paid a price for me to do what I do today," she says appreciatively. "It just made me want to stop and honor them, give credit where credit was due, and at the same time remind us that what we do with a seed has power for generations to come. If you bless the seed and nurture it just the right way, then the seed can rise up, but if you contaminate the seed, in future generations, there will be nothing to prosper from."